I get tons of emails from my amazing reader asking where to start transforming their rooms to a neutral color palette. Wow! What a smart and big and overwhelming question! 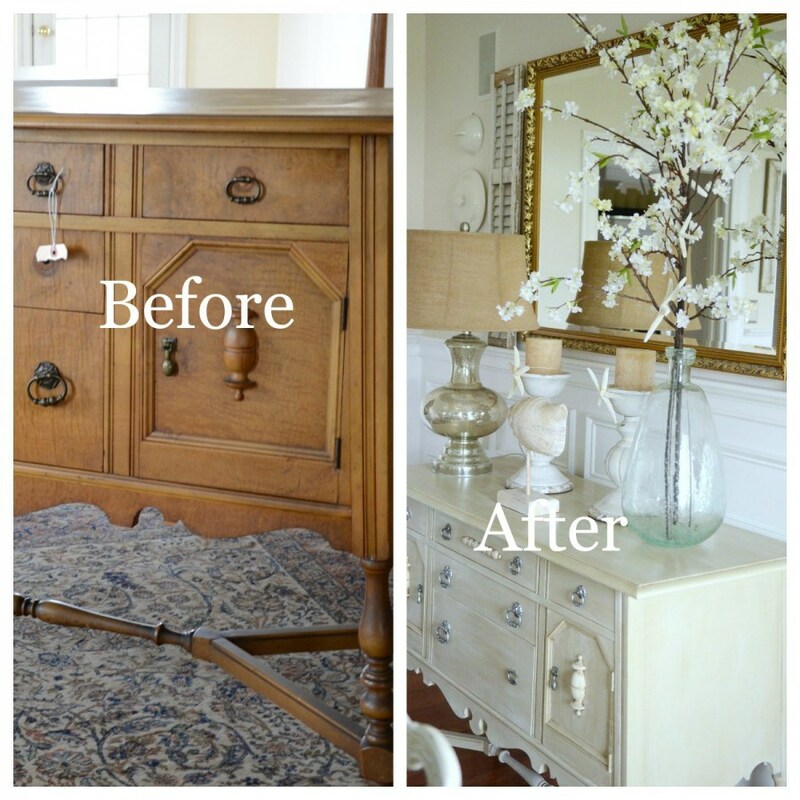 I went from a very traditional 18th century looking rooms to neutral and it was more of a journey than once-and-done! Actually, I am still on the road to creating neutral space. Even if you are not going neutral these tips will apply to any new style you are thinking about creating! 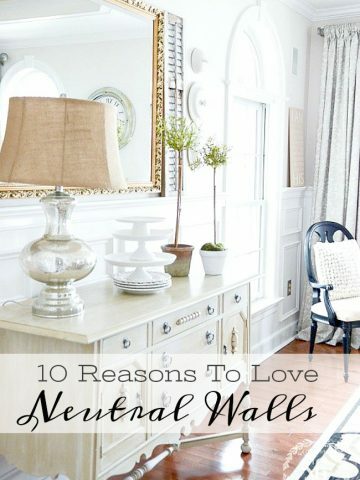 So here a few great tips for adding neutrals to your room! 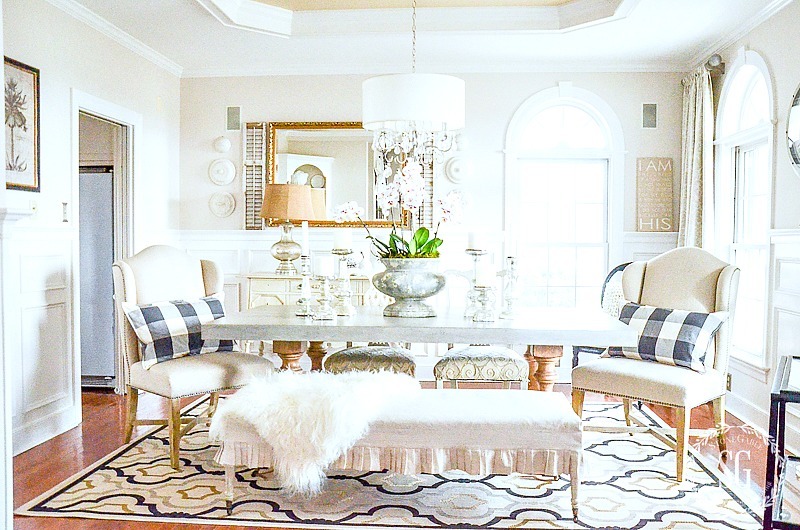 Today on Decorating Tips and Tricks we are talking about NEUTRAL ROOMS DONE RIGHT. Perfect for today’s post! They really go hand in hand! Tons and tons of great tips and advice! And listen on your smartphone. Find us on your podcast app! Also, subscribe so you don’t have to search for us! 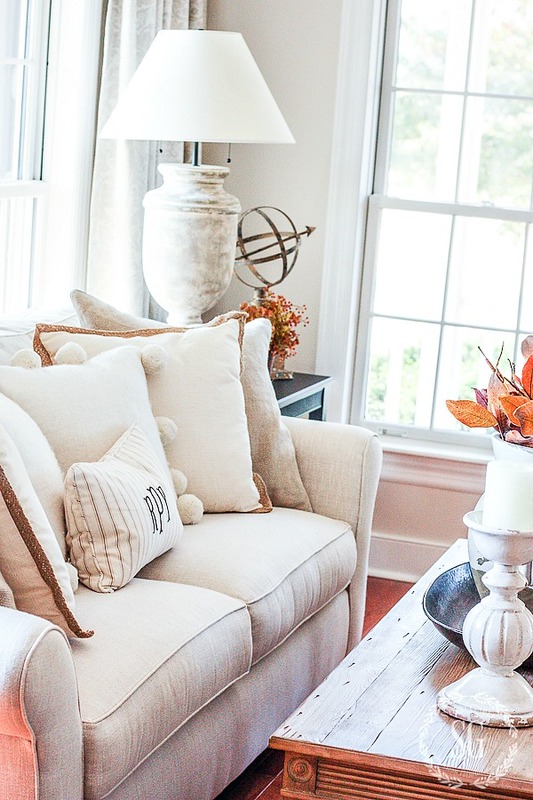 For me, decorating with neutrals is an easy and economical and restful way to style my home! The great thing about decorating with neutrals is that they are classics. And as styles change or I tire of what I have I can add color to my neutral decor that will make it look fresh and fabulous! 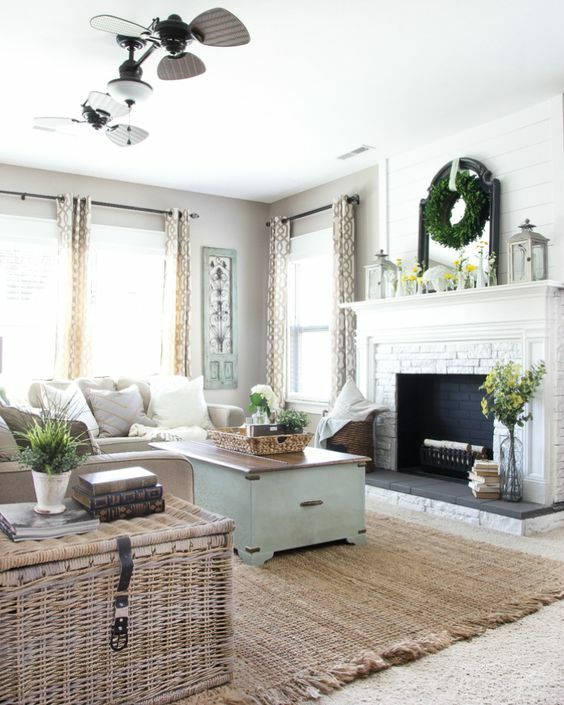 This gorgeous neutral family room is from a fabulous blog called Bless’er House. And I found it on Pinterest. 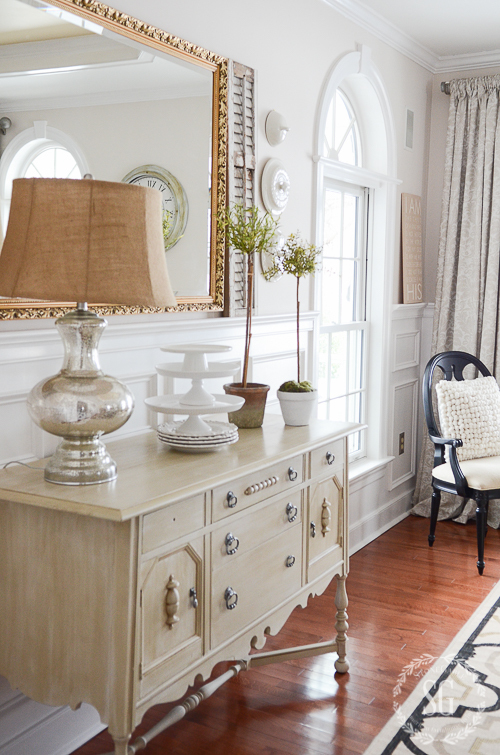 This room uses lots of soft neutrals for a warm and cozy cottage/coastal look. 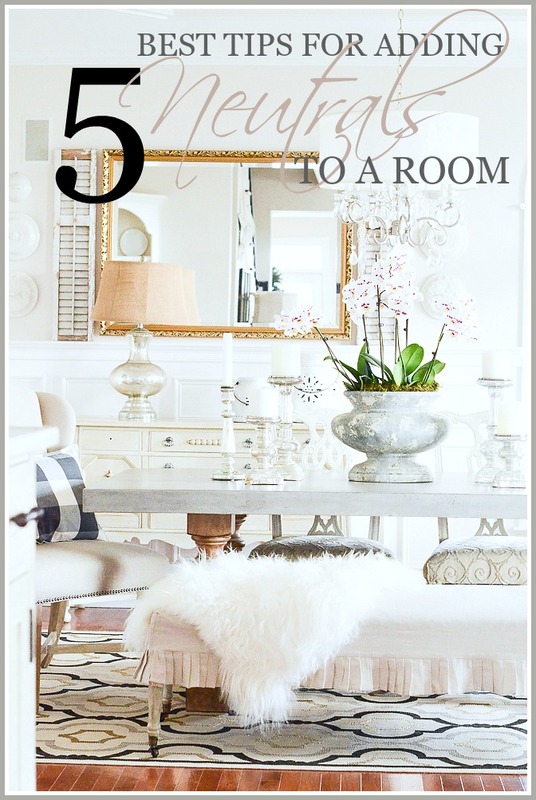 I put it on my “DECORATE MY HOME” where you can find a plethora of neutral inspiration. Creating a Pinterest board of your favorite neutral rooms will go a long way in defining what your neutral style really is! 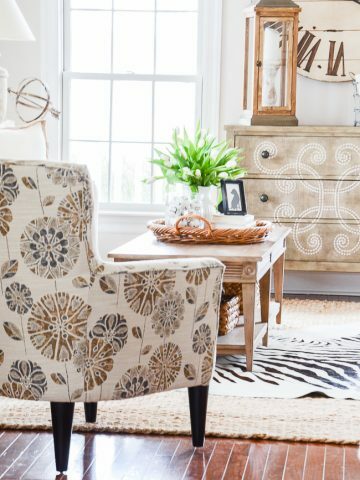 Here’s another neutral room with a totally different look from CURATED INTERIORS. And you will find this image on my DECORATE YOUR HOME board too. This gorgeous room has a much more classic, upscale look. But it’s also a neutral room! This room makes me weak in the knees! I think the quickest way to bring a room an updated, fresh look is to paint the walls with a pretty neutral. Something light and airy. So if you are ready for a change, get out those paintbrushes and get painting! The walls here at StoneGable are Sonnet (a wonderful soft beige/greige that works with almost anything!) and Simply White. I love love love simply white! It is the freshest (I know I’m using that work a lot in this post, but it suites) white I’ve found. Soft, but definitely a white! I think I might like to paint a whole house Simply White! I know this might be an investment, but it will go the farthest to achieving that neutral look we all just love! When I changed out my yellow sofa for a soft flax colored sofa it made a huge, huge difference in my whole room! I had to save and look and make the best decision I could! But when the sofa came I was THRILLED! I could really see my neutral room shaping up! Look at the two Pinterest images above and my living room. Our sofas are all neutral. This one thing will really start you on your way to the neutral room you love! Slipcover or reupholster a sofa you already have and love. Slipcovering is less expensive and is so on trend right now. Reupholstering can often cost more than buying new so be careful to know what you are getting when it comes to reupholstering! The sofa in my family room is slipcovered and has a nice tailored, yet casual look. Of course, the other option is to purchase a sofa. This might not be a quick fix but it is one worth saving for! My sofa in the living room is also a soft neutral flax and was an investment piece. I got it before anything else I purchased to go from a yellow and green living room to a neutral one! And it was worth every single penny! If you are thinking about purchasing a new sofa you might want to listen to Decorating Tips And Tricks episode 16, SOFA 101. You can listen below. It’s full of helpful advice and such a funny story!!!!! Let’s not forget bedrooms. A great quilt or bedspread in a neutral color will go a long way to giving your room a neutral look. All the “bedspreads”, quilts and duvets in my five bedrooms are white. They make every room look fresh and airy! For the Gable room, I mixed the white bedspread and euro shams with soft caramel and white bedding in a casual check and stripe combination. Perfect for a cozy bedroom, right? This is by far the most economical way to begin transitioning to a neutral room! A paintbrush is your magic wand! Learn to use it. 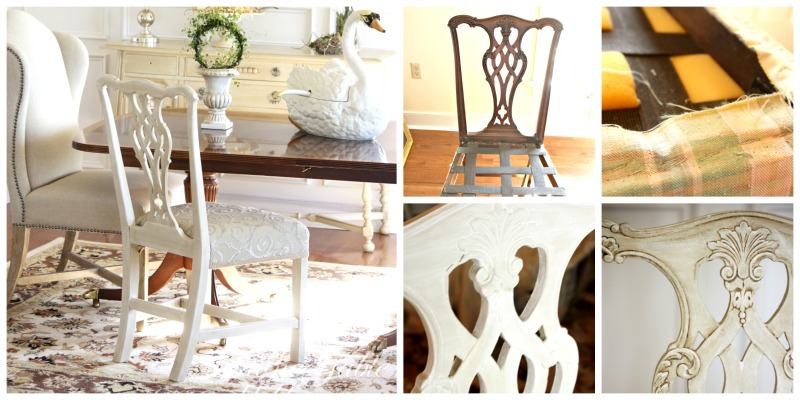 There are hundreds of blog posts and youtube videos to give you step-by-step instructions for painting furniture! It is really easy and addictive! Here is a post about THE MAGIC OF PAINT. It is full of ideas and advice on how to get started painting furniture. And lots of examples of furniture I’ve painted too! I love Amy Howard’s youtube videos. 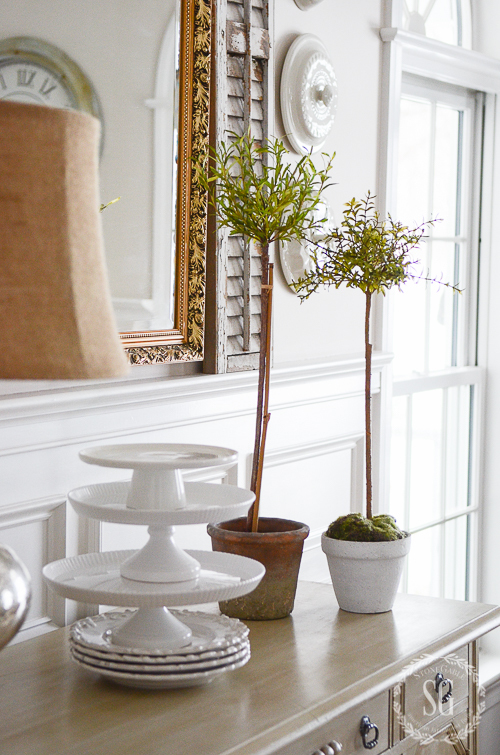 You can buy her chalk paint at Ace hardware and start creating your own neutral furnishings! You can see her gorgeous and informative videos HERE! 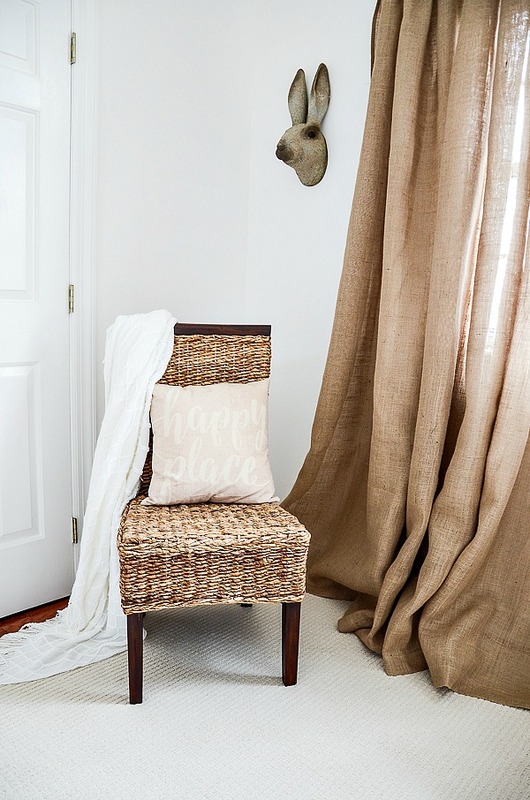 And here’s one my biggest transformations… changing my mahogany 18th-century chairs from Ethan Allen to a neutral painted chair with new neutral fabric seats. The image on the left shows the finished chair and the four images on the right show the process. You can get a look at the pastel plaid fabric that was on the chairs. What a HUGE difference! And you can see I was in the process of transforming this room from a pastel 18th-century traditional dining room. This is neutral decor 101! If you are transitioning a room, the easiest way to add neutrals to it is to cover large spaces with it! And the most economical and on trend way to do that is with a neutral and natural rug! Think jute and sisal for a rug. Even if you have wall to wall carpeting, put a neutral rug OVER what you have. Layering carpeting is so popular right now! This image was found on Pinterest! It’s amazing what you can find that is a great example of the style you might want to create! Here in my Gable guest bedroom I added a large white rug over my hardwood flooring. It made such a huge difference! Replace, cover and paint! 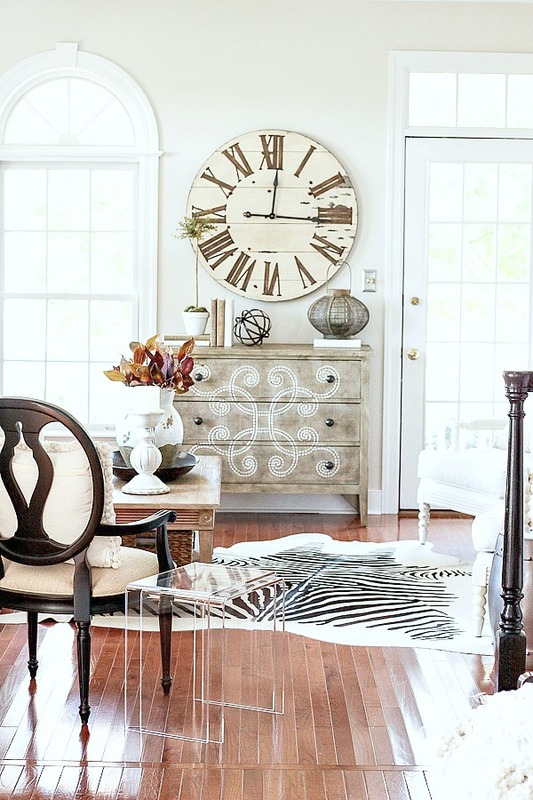 Those are the main buzzwords when you want to bring neutrals into a room! It is not an overnight thing but a journey. And you will love your room more and more at every step! If you’ve been wanting to change a room or two or even your whole house start now! You won’t regret it! You might like to follow me on Pinterest and see all the great things I’m finding every day HERE. Found you on Pinterest this summer in a post about shopping your home. It was an epiphany since I have silver, china and antiques galore inherited from my Mom and Grandmother. I have been busy creating vignettes, painting furniture and embracing the more formal pieces into my casual lifestyle. Thank you so much!!!!! So glad you commented Luanne! 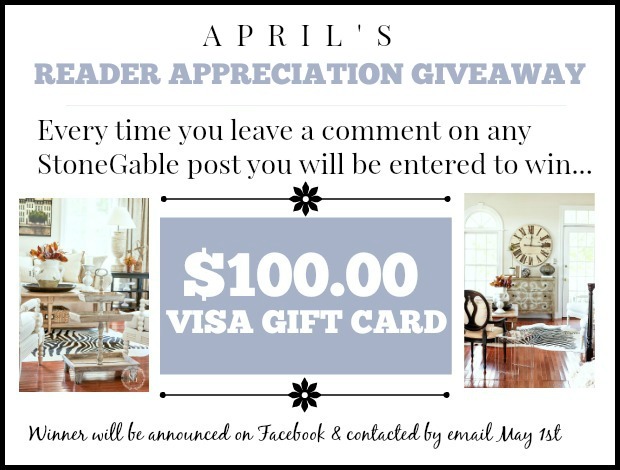 Welcome to the StoneGable family! I love the drapes in your guest room! Where did you purchase them? Thanks! They came from Decor Steals. You probably need to send them an email asking about them. Thank you for the directions to creating a neutral room. I would love to change the brown leather sofa but with pets and grandbabies I am leery to go with fabric. Any suggestions for a treated material that has the soft linen appeal? I do love your concrete table! You have such a gift for writing and I enjoy checking in every day to see what you have going on at StoneGable. Love all the great tips!! Oh I meant to add would you please share the source list for your gable room? You mentioned when you shared the reveal that you would have the source list in another post and there’s some elements I’d like to add to our home. I’d like to see the sources before things are no longer available. My husband and I painted the main part of our living area (family room, breakfast nook and kitchen) in Benjamin Moore’s Cumulus Cloud three years ago and I love it just as much now as the day we painted it. We’ve since added a jute rug and a white sofa with side chairs. My husband built me a coffee table using wood and iron and I’m slowly adding in warm elements with other wood and baskets. I love it and don’t know that I will ever get tired of it. I add in color with the changing seasons and then other times I leave it all neutral and it’s amazing how calming and peaceful it is. Even without any color besides the gray and white it’s never boring because of all the warmth of the wood and the different textures. Love your neutral bedroom (and big fan of your blog btw!) I’m looking for some new bedding and was wondering if you could share your sources? Thanks! I get the best thread count I can but I mostly I find my bedding at HomeGoods and Pottery Barn Outlet. Hope this helps. 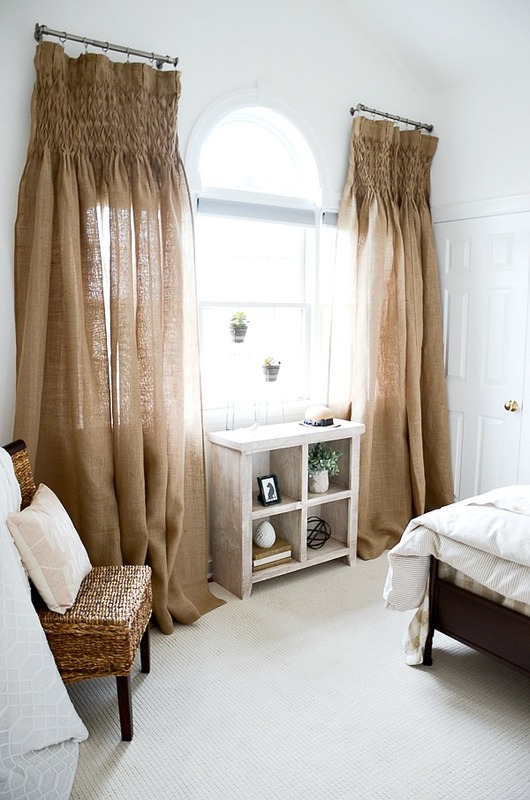 Love your neutrals…can you tell me where you purchased the window treatment in your latest guestroom make over. Love the look. I am working on neutral in my home. I am starting with paint and working from there. I like the look and of course, your home is the best. My daughter is going neutral in her house. I prefer some color. 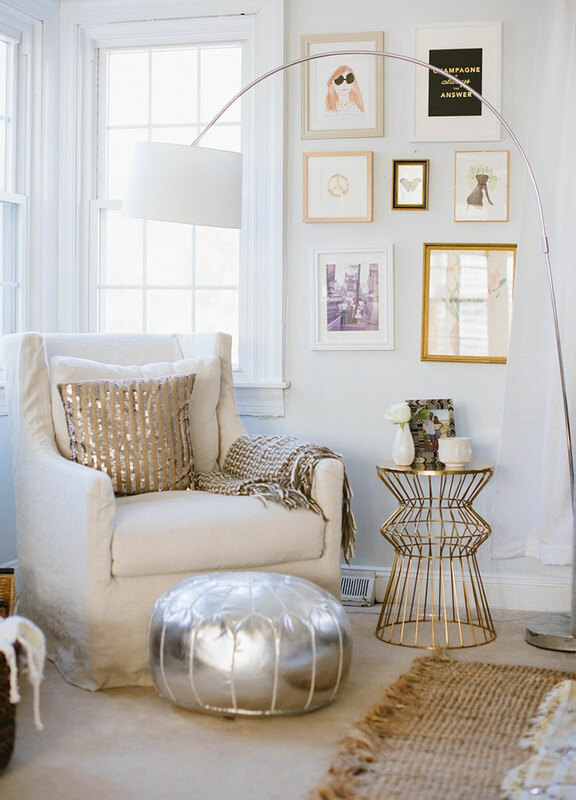 Beautiful neutral spaces and always encouraging and great ideas. Thanks! Such pretty examples of neutral spaces! I’m doing my dining room right now for the ORC and the whole thing is going to be neutral and I’m loving it. I also have slowly been transforming my home to neutral. I have the Pottery barn sofas. I haven’t washed the slipcovers yet and am very nervous to do it. Has anyone done it and is there a trick to it? I would love your advice!!! You said you bought your sofa at Pottery Barn. Did you also buy your slipcovers there? Yes, just be careful. My sofa’s slipcovers are fine. But both of my children got a PB slipcovered sofa and they had so many problems with the fabric pilling! I have done most of this in my great room. Now onto the bedrooms. It does get a bit pricey, but once it’s completed, almost any other accent color works and gives it a nice “pop”. Good tips. Love today’s podcast and I love neutrals with a touch of black and now for spring add colors with fresh flowers and small plants. Love the neutrals in your home. 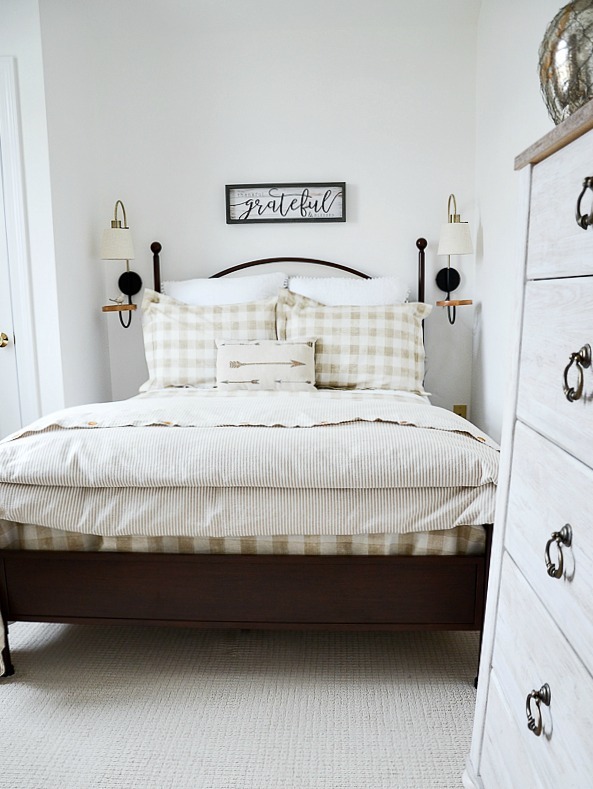 I love love love the bedroom with the neutral checked euro shams and checked quilt under all the white bedding. I’m so in love with the neutral checks! Where did you buy them? I must have them!!!! Thanks! I have loved neutrals for awhile. I think they make a home feel calm. With lots of texture and pops of black it is anything but boring! I just hopped on the neutral train and I am LOVING it!!! Thanks for the tips! Neutrals are my friends! Love the neutrals w/ black! I am also in that mindset! I love the neutrals. Redoing master bedroom and you have changed my mind on the color palette love the sonnet color. Thanks Yvonne. I’ve been working on going neutral for awhile and your suggestions are great. Do you consider cocoa brown a neutral? Most of the pictures include white sofas which wouldn’t work on a real working farm with regular infusions of top soil etc. I have lived in the same house for 30 years now. I am ready for a whole new look and I usually go for lots of color. But I am really drawn to the neutral look. Amazing tips and beautiful photos!! 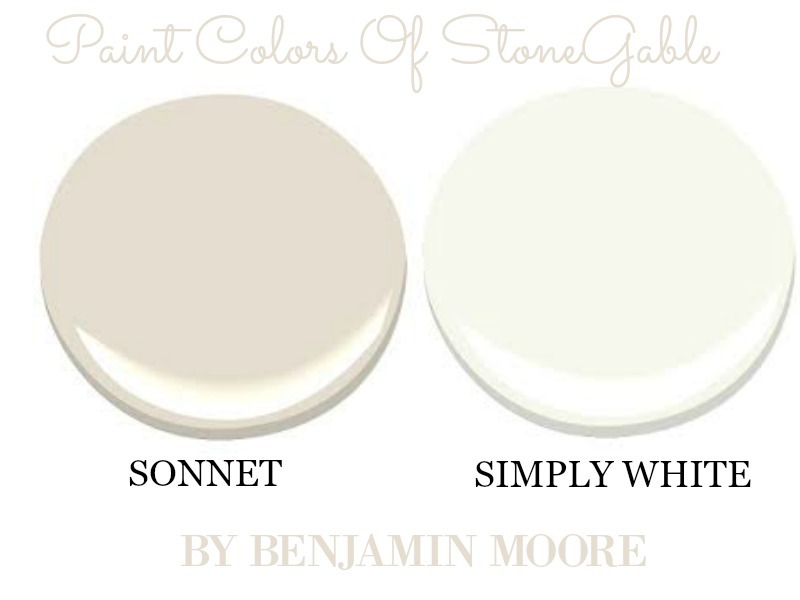 I will definitely follow the video links you posted and check out Sonnet paint color. I have a whole file folder of greys I’ve been looking at so what is one more!! 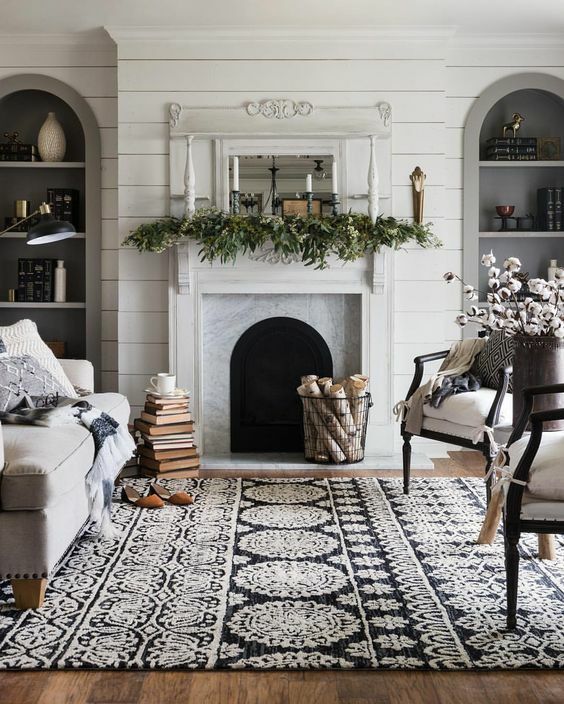 I love neutrals so classic and yet fresh, I’m thinking I will be painting my living room, dining room, and the hall ways downstairs and upstairs in the near future. Thanks Yvonne for the inspiration. 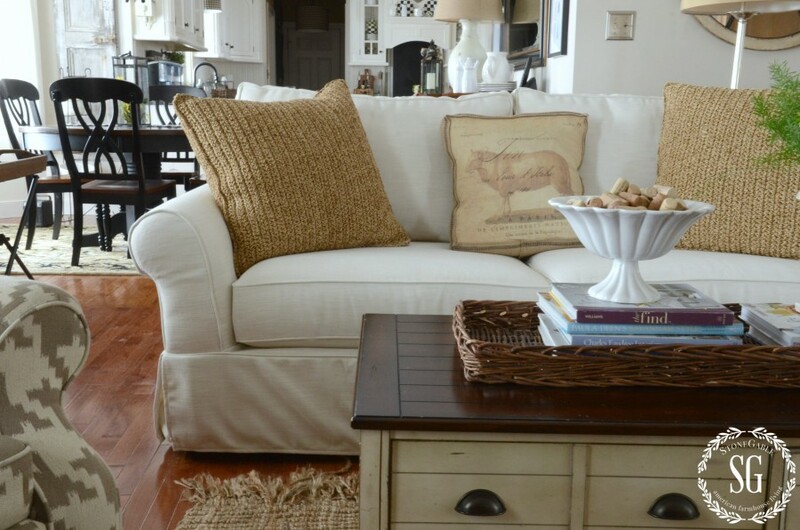 wonderful tips on neutrals…we just painted our living room Valspar “dove white” great off white neutral ! I am also wondering if black is a neutral. I am thinking of buying a black leather sofa and using French Country black and white throw pillows. I have other splashes of black in my living room and the walls are “humble gold”. I like the contrast of the black and gold. I think a pop of black works great with neutrals. Lots of black and white is really its own color pallette. I love all of your ideas of how to add neutral to our homes. I am really tempted to repaint all of my walls and start over after seeing your beautiful home. Where did you get your slipcovers? It is a pottery barn slipcovered sofa. I get all my ideas from you and Pinterest! Thanks to both of you. Would you please advise where you purchased your sofa and the fabric name. Thank you for your time. Hi Susan, I found my sofa at The Pottery Barn. It is a foam core and down wrapped. The fabric is a performance fabric called Flax. My sofa is holding up so so well. But I know there are many people who have trouble with the fabric on some sofas. Both of my children have had lots of pilling on their sofas and the replacement sofas. One of my kids is having such a hard time getting it made right. So, please do your homework first! These tips are right on target Neutrals, without texture, are boring, so you nailed that one. Adding “life” with live plants works wonders, too. My vote is for a small pop of color or two…you can still stay neutral with just a bit of color. In retail the old quote was: “You need to put some lipstick on the pig!” Enjoyed today’s post and podcast. Yvonne, can you update us on your ankle??? I had surgery yesterday to remove the screw that was giving me a lot of pain. Surgery went well and I’m back in a boot. We will see how things go! So glad for this “refresher course”! Was feeling a pull back into my Sicilian Gypsy phase, but I’m re-inspired . Thanks! I am loving all these neutrals – your home is beautiful. I agree, Cindy! Living with neutrals is very economical because they are in style so much longer! I am going neutral in my living room. So far I have a neutral couch and I made slipcovers for 2 chairs. Slowly but surely I’m making the transition. Thanks for the tips. I love all of your light neutral colors, but was wondering what you think about grays and blacks? Are they considered neutrals, too or only light colors like whites, light tans, etc? Tans, grays and blacks are neutrals and pair well with lighter colors. I love all of the light neutral colors, but I have a question. Is black considered a neutral color, too? Thanks! Yes! 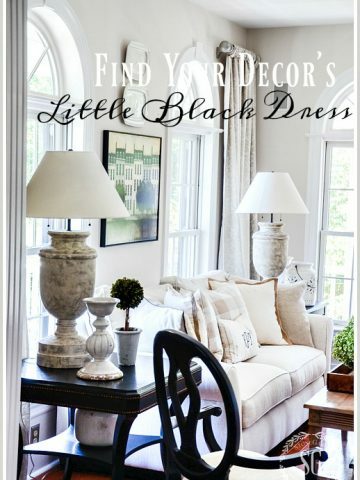 And a pop of black really grounds a neutral room! I’m slowly going neutral and enjoying the transition. I think it makes a room look more calm and less stressful especially if it’s not cluttered. Good post! Love your paint colors so nice you are willing to share color and type of paint. Hi Bet! They are all Benjamin Moore colors! Hope this is helpful. You have such a beautiful home! I found this so helpful! Thanks so much Yvonne! ? Great post! My house is mostly neutral with small pops of color. I am in the process of changing out some things so your tips and tricks are right on time. Hey, Margaret what rug. If you can tell me I’ll be sure to answer you! I am so excited to be going neutral in my rebuild. I love all your ideas and advice. I have to ask, is your back cushions on your sofa loose or semi attached. I have always had semi attached but was thinking loose may hold their shape better. Thanks! So excited for you Candace! All the cushions on my sofas are not attached. That way they can be “fluffed” and turned around and change sides of the sofa. I do this weekly. They might get a little “slouchy” but a good punch and fluff resolves that issue. More important than attached or not is the quality and the type of sofa. I love a foam core, down wrapped sofa! 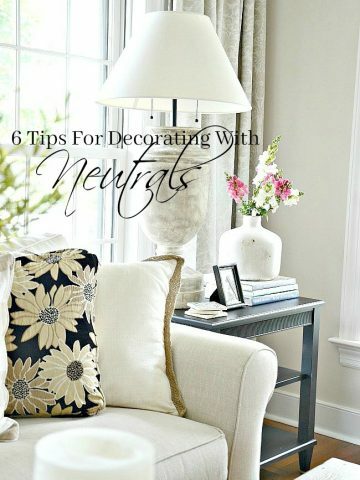 Great tips for going neutral! I love what you’ve done with the neutrals colors. It makes the room feel larger and so calming.